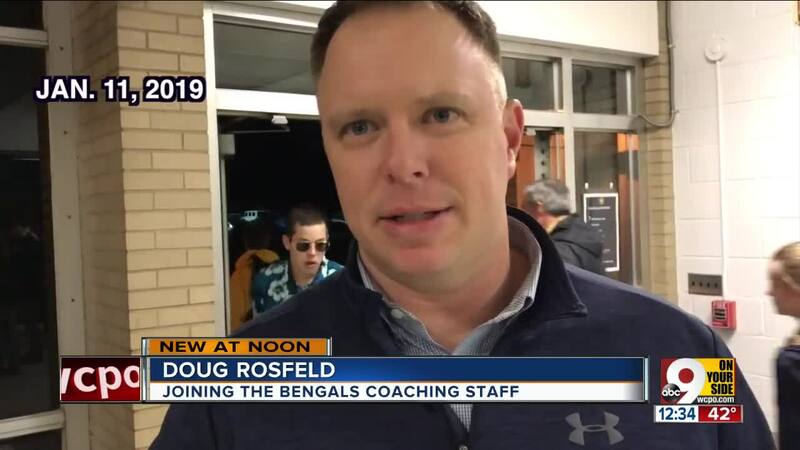 SYCAMORE TOWNSHIP, Ohio — Moeller head football coach Doug Rosfeld has accepted a position with the Cincinnati Bengals, Moeller High School announced Monday morning. Rosfeld was named the Bengals' director of coaching operations. Rosfeld, the Greater Catholic League South Division Coach of the Year in his first season as the Crusaders in 2018, will join Zac Taylor’s staff with the Bengals. Todd Naumann, a 1991 Moeller graduate, was named the acting head football coach. Taylor, the former Los Angeles Rams quarterbacks coach, was named the Bengals head coach Feb. 4. Rosfeld, 39, and Taylor, 35, worked together at the University of Cincinnati in 2016 when Taylor was the offensive coordinator and Rosfeld was the director of player development. Rosfeld, a 1997 Moeller graduate, led the Crusaders (6-5) to the school’s first outright league championship since 2013 with an unbeaten 3-0 record and a postseason berth. Rosfeld was the sixth Moeller head football coach in program history and the fourth head football coach to make the playoffs in his first year. Moeller hired Rosfeld as its head coach Dec. 4, 2017 , becoming the second Moeller alumnus to be named the Crusaders’ head football coach (Bob Crable, 2001-07). Rosfeld was 38 when he was hired. Rosfeld succeeded John Rodenberg, who stepped down Nov. 7, 2017 after an 80-41 record including two state titles (2012 and 2013) in 10 seasons at the school. Prior to being named the Moeller head coach, Rosfeld had been the University of Cincinnati football’s director of player development since March 2015. “Moeller is the only high school in America I could consider working for,” Rosfeld told WCPO the night before he was hired by Moeller. The next day, Rosfeld was introduced in front of family, friends and the Moeller staff in the school library. UC Director of Athletics Mike Bohn was also in attendance. Rosfeld, his wife, Abbie, and the couple’s six children, live in a Cape Cod home behind Moeller’s Gerry Faust Complex. UC received the American Athletic Conference Team Academic Excellence Award this season for earning a 3.07 term grade-point average. Rosfeld joined UC in 2015 after teaching social studies for nine years at Moeller while also being an assistant football coach. He also served as the Crusaders head rugby coach from 2009-14, helping to found the program. The rugby team had four consecutive state finals appearances and a state title in 2010. As a Moeller football assistant, Rosfeld served as the offensive line coach, overseeing pass protecting, the run game and assisting on special teams. He was an assistant coach starting in 2005 under former head coach Bob Crable and then Rodenberg. Rosfeld played football under former head coach Steve Klonne in the 1990s. Moeller has 35 postseason football appearances, which is tied with Newark Catholic for the most in Ohio High School Athletic Association history. Moeller has won nine state football titles (2013, 2012, 1985, 1982, 1980, 1979, 1977, 1976, 1975). Moeller has not announced its 2019 football schedule. Athletic Director Mike Asbeck said Feb. 7 he hoped to have it finalized within the next week. Moeller is expected to play three home games at Princeton High School’s Mancuso Field at Viking Stadium this upcoming season. It is a one-year agreement with Princeton. The Week 10 game against a Canadian opponent is expected to be played at the Gerry Faust Athletic Complex on Moeller’s campus. Roettger Stadium in Lockland had been the primary site for Moeller football home games from 2009 to 2018. Moeller started playing there in 2002 until 2006, according to Moeller sports information director Steven Albrinck. The Week 10 game would be the second time Moeller has hosted a varsity football game on its campus after also playing there in Week 10 of 2016.